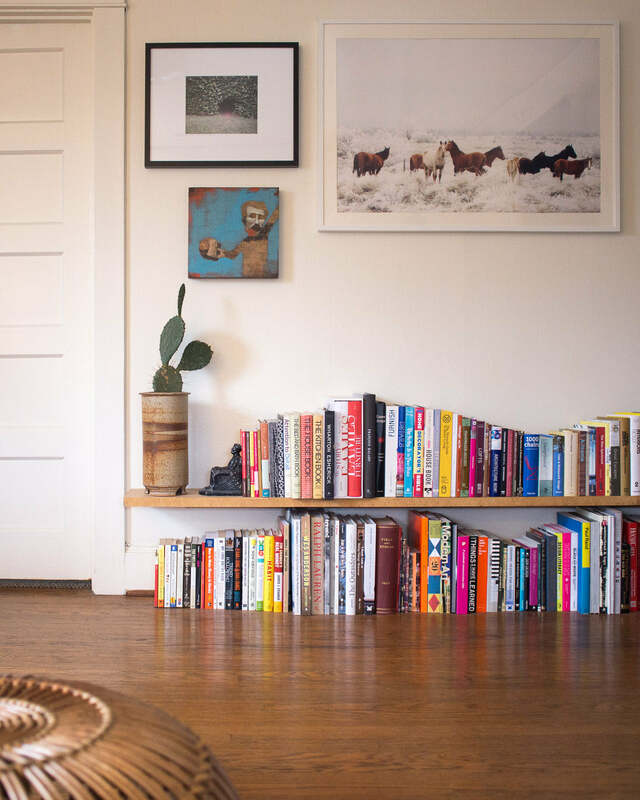 When living in a small space, storage is everything. After moving a little while ago and slimming down some of my library, I was in need of a simple shelf that was extra sturdy and wasn't a huge mounting hassle. My previous books shelves covered a wall with a lot of engineering to mount it into the old house's lath and plaster structure. This one had to be simple, yet strong enough to hold a couple hundred pounds. After working on the idea, I wanted a clean 'floating style' shelf, but knew I had to fake it a little for the weight it needed to hold. I had a very old, beautiful birch plank that would be perfect. It was 5/4 thickness, so plenty strong enough for the span I had planned. It's length was 84", and I figured as sturdy as it was, I could get away with two legs without any sagging. The key to this construction is the pipe vertical legs and the mounting cleat on the wall. 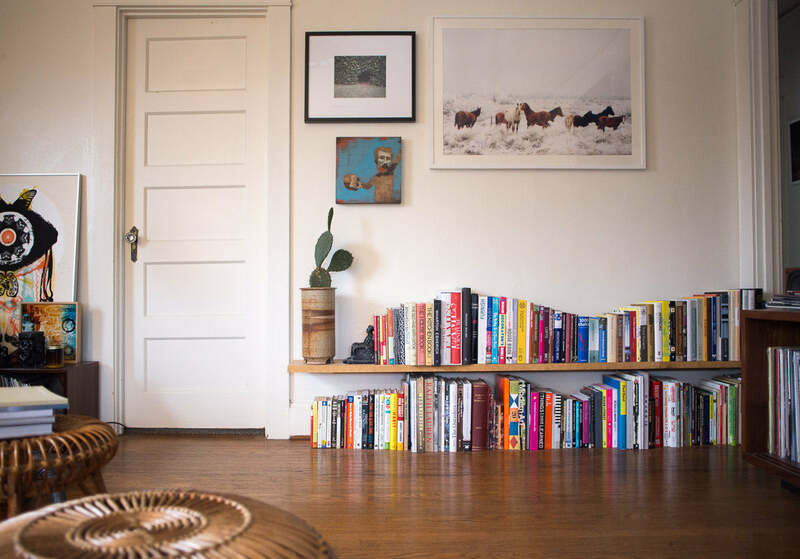 It makes the looks simple and clean, and once surrounded by books, the vertical legs seem to disappear. First consider your desired height. I measured my tallest book and gave it an extra inch. 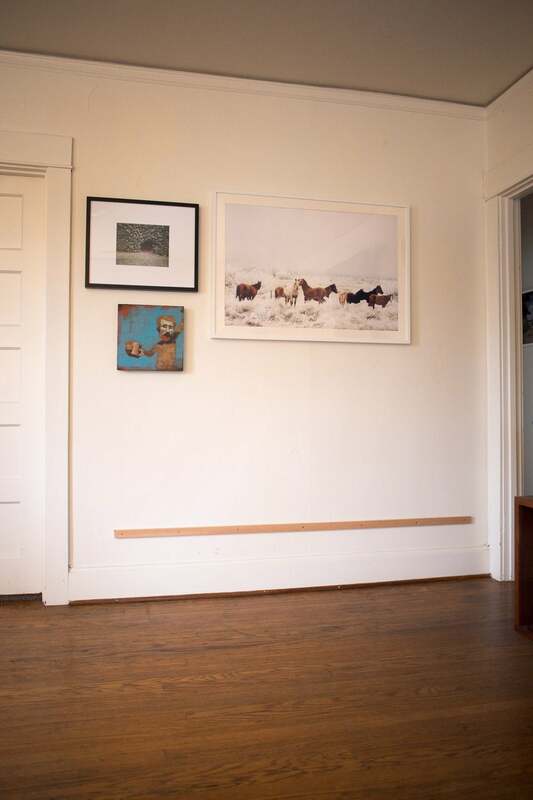 Make it too much higher and you'll more likely see the shelf's hidden mounts. Take your height requirement and match up lengths with two footing structures. I used 1/2" galvanized pipe with a flange on the top and a coupler on the bottom. The bottom coupler is used for micro height adjustment and provides a good surface area to be resting on the floor. 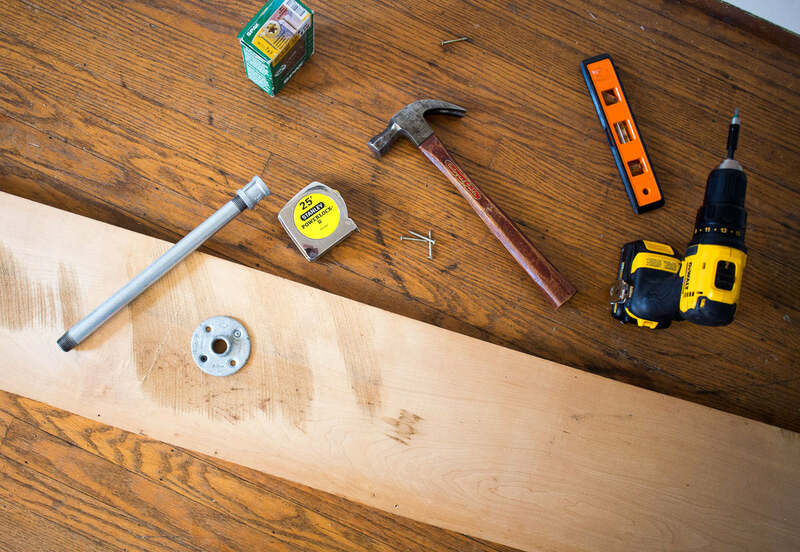 Assemble our legs parts and install them on the underside of the board, just and inch forward from center. They need to be close to the center since the book force will be downward and that'll make it the most sturdy. Too close to front and the weight shifts to the cleat, plus you're more likely to see the legs. 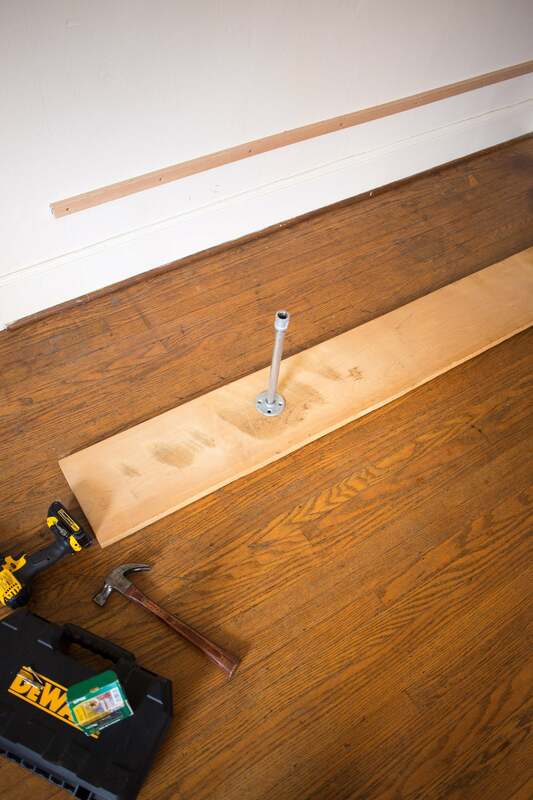 After installing the legs, temporarily prop the shelf to the wall and level the shelf front to back. Mark the underside of the shelf on the wall and that's the line to follow with your cleat. I used a 1x2" for the cleat, about 75 inches long, so it is inset from the ends of the shelf. 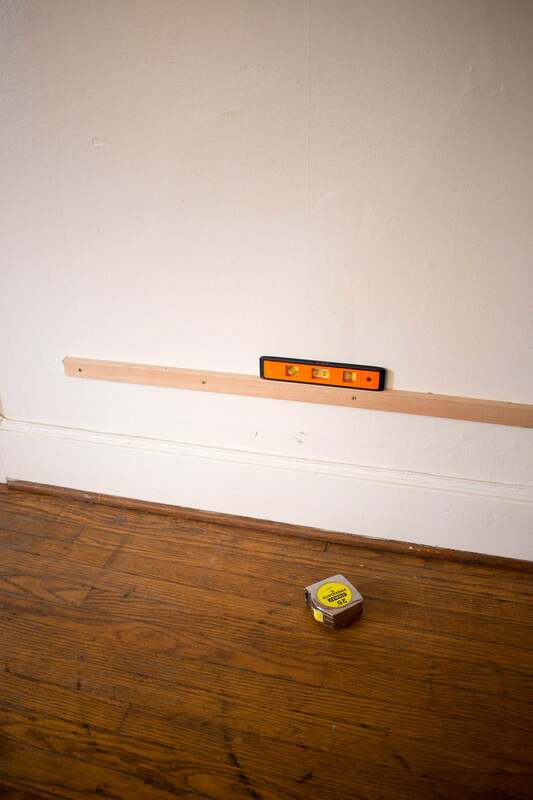 Try to find studs or a sturdy mount when installing... I used about six screws to mount flush against the wall. 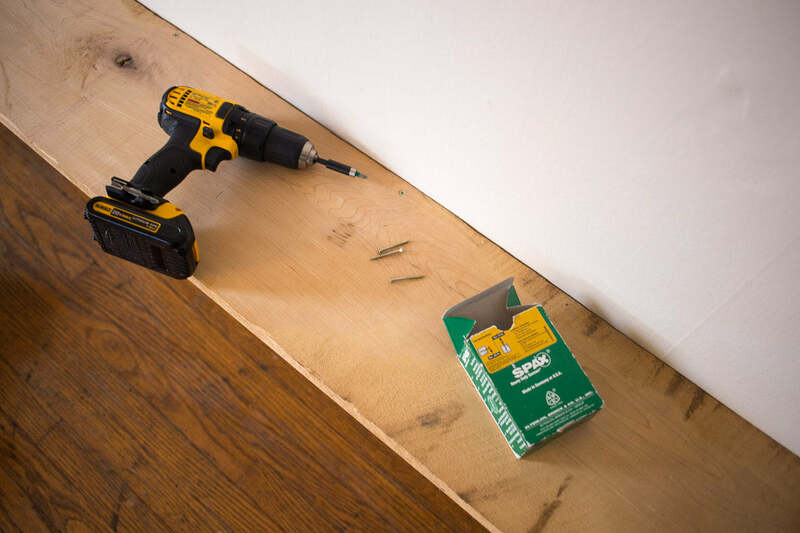 When your cleat is up, position the shelf again for mounting and re-level to make sure your surface doesn't need adjusting. The couplers on the legs can raise or lower for a perfect level. Then attach to the cleat with screws. I used self-drilling wood screws, which I prefer on thick boards. It only takes a few to secure the shelf to the cleat, since the majority of weight is on the pipe legs. This design works great for books or heavy items that aren't prone to tipping. I wouldn't advise using this construction as a bench unless the cleat was a little larger. 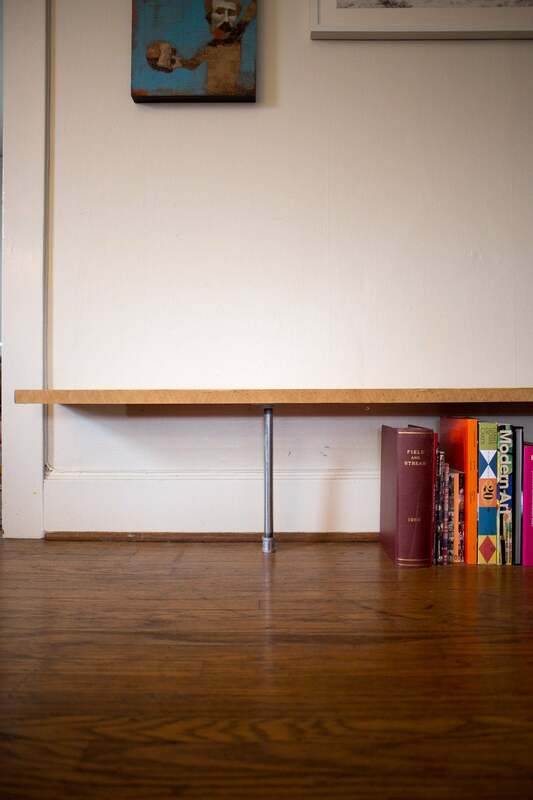 Lastly, fill up that shelf with your books and position some larger ones near the legs to help disguise. If you're wondering about my organization style, I separate categories with each 'wave' of books.